The focus is on money management advice. The interactions are digital and around financial goals such as retirement, saving, tax planning and regular investment. You have access to investment management and financial planning. Figure out what you need—just some financial transactions or more in-depth, goal-linked planning. Most robo-advisors at present primarily offer mutual funds as the solution for financial objectives. This might seem restrictive, but in terms of transparency, returns and accessibility, mutual funds are found to be most appropriate to address goal-based asset allocation needs for retail investors. Some offer other products like insurance, deposits and direct stocks. Broadly, the robo-advisory platform can be categorised into four—automated investments, direct plans, goal-based advisory and full service advisory. Auto-pilot: In this mode, you select among the offered ‘packages’. You select what you need, and then stay invested. One such platform is Scripbox, an online MF investment service firm that offers three ‘boxes’—equity, fixed income and tax-saving. Sanjiv Singhal, its founder and head of product strategy, said, “The objective is to reach out to the young earners and first-time investors. We want to bridge the gap between awareness about mutual funds and the execution. While linking a goal is important, sometimes it’s hard to even think of a goal. So the idea is to get started and build investment discipline." Scripbox recommends a total of eight funds—four equity funds, two fixed income funds and two tax-saving funds, split into the three different boxes you can pick. Direct plan-based: Companies such as Bharosaclub.com, Orowealth.com and Invezta.com offer a low-cost direct plan option. You can even switch your existing mfs into the direct plan. there could be a nominal advisory or convenience fee attached to transactions. Prasad Janardhanan, product manager, Invezta (Valuefy Solutions Pvt. Ltd.), said, “We have been pained with biased advice, hidden fees, commissions and profits-over-people approach. We are democratising healthy investing with a zero commission platform and institutional quality robo-advice." These platforms offer both do it yourself option and the choice to invest based on goals. Goal-based advisory: Such a robo-advisory is structured on asset allocation, which means fund selection is a result of the information you provide. While these websites offer basic advisory on how to approach your long-term investments, the option to only transact, which allows you to simply login and buy the funds you want. FundsIndia.com, for example, helps you invest based on goals. One of the first firms to get started with an online distribution model, it also allows transactions in shares, company deposits and corporate bonds, and now has an advisory service as well. BigDecisions.com, another robo advisory platform, answers your initial questions, but doesn’t offer products. Full-service: If you need in-depth advice, look towards a full service robo-advisory, which will ask you to answer a detailed questionnaire to assess your risk appetite, financial goals, saving and spending pattern and current asset liability position. The information is analysed to assess how you are managing your monthly liquidity, whether spending is more than earning, what your net worth is, do you have enough surplus, taxation and so on. “We are not just a platform to sell mutual funds. We use precise tools to provide personal financial advice, which we customise. For us risk management is as important and a part of personal finance as wealth creation is. 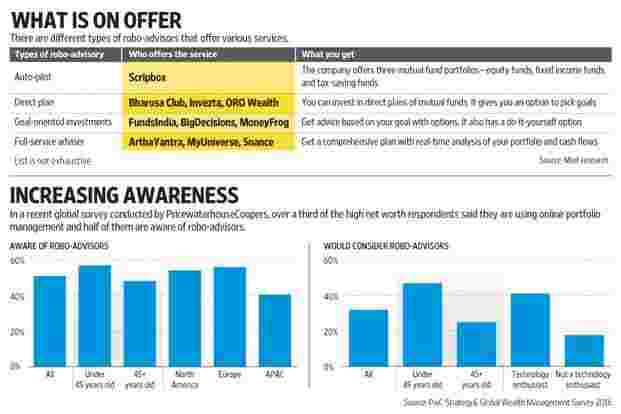 moreover, portfolios are entirely customised to every individual’s risk profile thanks to millions of simulation done of various scenarios to suit each client," said Nitin Vyakaranam, chief executive officer and founder, ArthaYantra, a full service robo-advisor. The firm, which has been around for six years, helps you connect with partners that can assist with buying insurance or taking a loan as per its recommendations. Another newly launched full-service robo-advisor is Aditya Birla MyUniverse. This site allows you to link almost all your financial details directly into the account you create here. You can link your bank accounts, credit cards, investments and loans. Based on this information, it gives you analytical reports about your financial health, expense management and net worth, among other things. You can also choose to simply transact. “We provide two types of services—personal finance management and product specific mutual fund investment," said Rahul Parikh, chief executive officer, My Universe.com. 5nance.com is another platform that allows you access to analytics and also offers execution capability. Dinesh Rohira, founder and chief executive officer, 5nance.com, said, “The analysis of spends and asset details helps in focusing on specific issues. For example, you might find that eating out less often can help you save better to fulfil the long-term goal of child’s education." The site offers other products as well, including equity shares, gold, credit cards and loans. To get started on a robo-advisory platform, you will have to create an account. Some platforms, especially if they allow transactions, will ask you to add bank details, Permanent Account Number (PAN) and know-your-client (KYC) details. If buying a mutual fund, you can choose a systematic investment plan or invest a lump sum. While not every platform is a full-service robo-advisor, all offer automated investment advice. This essentially means that a selection of mutual fund schemes is recommended as per algorithms designed by each platform. Each service provider may recommend a different set of funds for the same goal. Some recommend four, some eight and some just one. The main aim is to get the long-term asset allocation right. Vijay Kuppa, co-founder ORO Wealth, an online mutual fund investment platform that promotes direct investments, said, “We run an algorithm based on quantitative and qualitative criteria and which recommends the fund. Consistency of performance is important and that is built into the algorithm. The outcome is one recommendation for a large-cap fund, one for a multi-cap fund and one for a mid-cap fund." Recommended portfolios are reviewed periodically. Let’s say, you have recently started with the service and a month later the chosen funds are reviewed and a new one added. Should you sell one of the older funds and buy a new one? Not necessarily. The robo-advisor will provide relevant reasons for making a change, but it will be your decision to change or not. As a thumb rule, churning schemes often is not efficient. And no one fund can be a top performer year after year. Aim to bring consistency in returns and adhere to your initial allocation, at least for three years (if it is a long-term investment). Remember that these are automated portals—mostly recommendations are made; handholding is done (in some cases) only in extraordinary situations. Most of the advice is structured around long-term investments. But what happens during short-term market volatility, or in case of a personal emergency? The automated advisory platform will send reminders stating that you are moving away from the long-term goal, but the exact cash flow and behaviour management suggestions may not come through from those that are not full-service platforms. Sadique Neelgund, founder, Network FP, a professional membership organisation for financial planners, said, “An investor who wants to start with a systematic investment plan of a small amount can look towards robo-advisory platforms as they are easy to access and offer elementary planning for free, whereas human financial advisors may not find it commercially viable. It works well till markets are positive. However, support is required when events go sour. As of now, there is no way to know whether these portals will be able to help investors hold on in rough times. Behaviour plays a bigger role when it comes to delivering good returns." This is where human intervention helps. Comprehensive robo-advisory service providers say many people want some interaction, even if the advice generated is automated. Srikanth Meenakshi, co-founder, FundsIndia.com, said, “It’s not enough to be reactive on portfolio queries. There is an expectation of proactive interaction as well." Keeping this demand in mind, Vyakaranam said they have qualified certified financial planners to help with the explanation of the plan recommendations. The solutions, however, remain automated and don’t originate from the human adviser. If you are well-versed with investment products, robo-advisors can help you make quick, easy and cost-effective transactions. If you don’t understand the nuances of investing and need to be shown a target to move ahead, there are robo-advisory platforms that give you the required push in choosing goals and making regular investments. The full-service platforms, in fact, hand hold you through the entire financial journey of understanding your spending habits, cash flows, net worth, helping with the taxation and then building a kitty towards financial goals. ArthaYantra is one such platform which doesn’t have the option to just invest yourself; they believe investments have to part of a financial plan so until the appropriate analysis is done products don’t get recommended. If you are starting out with investments, these platforms work well in their ease to use. The analysis is mostly free, but in some cases, if you want to go further with the recommendations, there could be an annual fee. Typically, the fee depends on the adviser and service. For example, ArthaYantra charges 1,000 annually for its premium investment advisory service; Invezta charges 109 per month for its premium service. As the sector evolves, more innovation beyond simple selling is expected. For do-it-yourself investors, it will ultimately be about costs. Platforms with access to direct plans and recommended portfolios (which means funds have already been selected) are likely to have an edge. Tackling one goal at a time may work with small or first-time investors, but eventually as the portfolio grows and financial needs expand, more in-depth financial planning may be needed, which can come through an offline adviser or through a more comprehensive robo-advisory platform. At present, there are 39 robo- advisory companies in India, according to Tracxn, a data analytics company. Of these, so far 10 have got funding. An early entrant is FundsIndia.com has received $15.41 million so far from Foundation Capital, Inventus Capital Partners and Faering Capital. Other robo-advisory companies who have received funding include MyUniverse ($9.7 million) and Scripbox ($3.22 million). Ultimately, its portfolio performance that will matter. So, the algorithm has to be accurate and better than others in selecting and reviewing recommendations. It’s too early to judge or analyse the existing platforms, but as these firms go through more market cycles and recommendations change, the winners will come through.